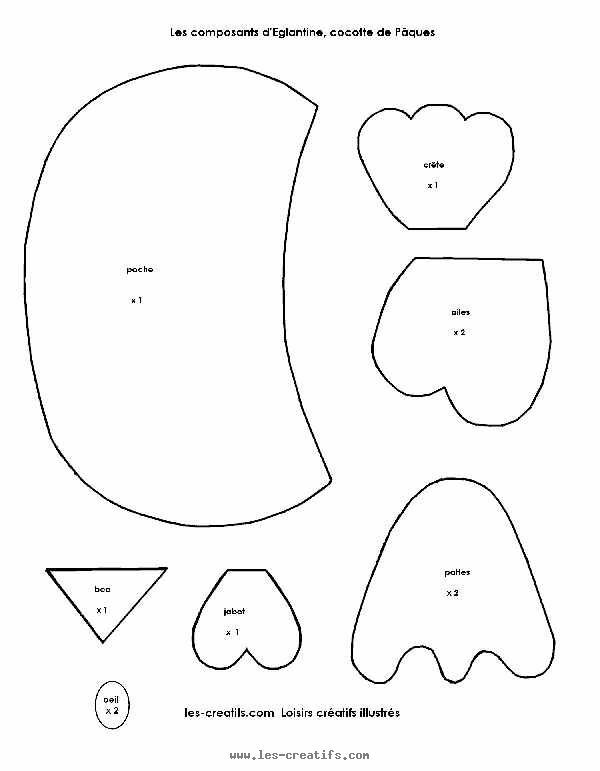 Print out the templates opposite. 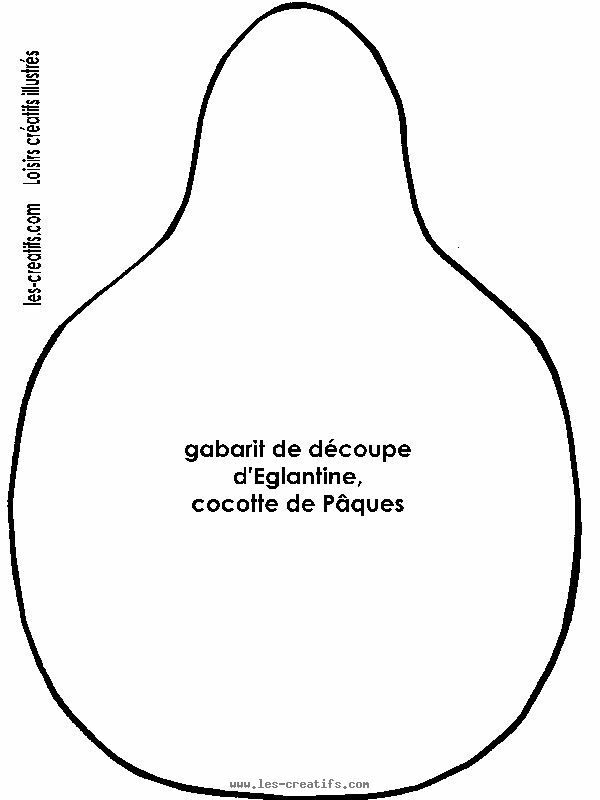 Each template must be printed out in A4 format (the hen's body takes up the entire page, 8.3 x11.4 inches), this means the hen is properly-proportioned in relation to the wooden spoons. Fix the 'pouch' in position using 2 pins. Next, with the scissors, make a slit, about 1.2 inches long in the hen's back through which you will slide the wooden spoons. This slit must be 0.4 inches from the bottom of the yellow 'pouch', and is therefore hidden by this 'pouch'. The sewing stage : using two strands of the orange thread to sew on crosses to fix the 'pouch', then the wings in position. Sew the end of the beak and the top of the wattle together: this gives a 3D effect to the beak. Then, using a cross shaped stitch, fasten the other 2 corners of the beak. Sew on the crest. 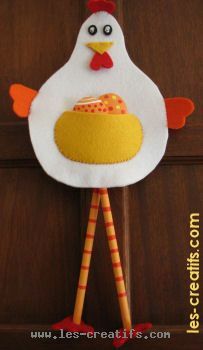 If you like, you can add on a ribbon (here it's an orange ribbon), that you will use to hang Eglantine up. Fasten on the black felt eyes by sewing them on with the white thread using embroidered satin stitches. 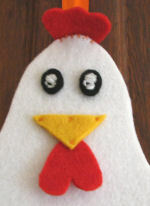 Here we're aiming to sew white onto the eyes, leaving a little black spot to the side to create the hen's expression. The painting stage Create a light orange by mixing red and yellow paint together. Paint the entire surface of the wooden spoons, applying two coats of paint. Paint the rounded back of the spoons as you would Easter eggs, with little circles and curved lines to emphasize the egg shape. You may use the flat wooden end of the large paint brush handle like a rubber stamp (as seen here with the yellow and red spots). Once the paint has dried, paint red stripes onto the handle of the wooden spoons. once the paint has dried, place the wooden spoons in the 'pouch'. Using the pointed-tip scissors, cut out 2 foot-shaped pieces of felt, into which you will set the ends of the wooden spoons. Apply glue to the bottom of the wooden spoons and the edge of the holes in the felt feet, then push the spoons in and hold them there for a few seconds. Leave to dry. All that's left to do now is to add Eglantine's eggs and feet (either crossing her legs or leaving them straight...) and to hang her up.